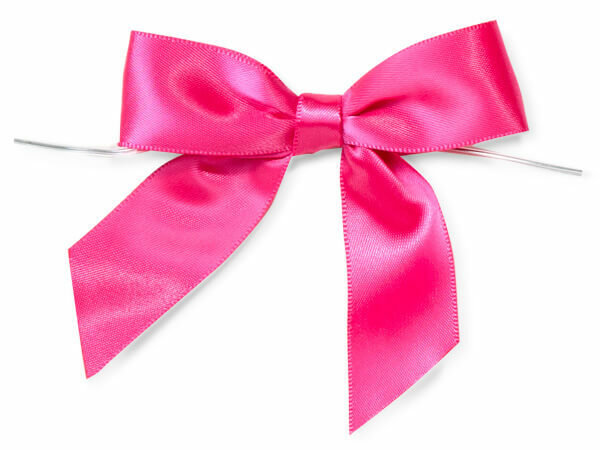 Buy More Pre-tied Satin Gift Bows Save More! Hot Pink Pre-Tied Satin Bows with an attached 5" twist tie are perfect to easily close a cellophane treat bag, or to put the finishing touch on a gift bag handle. These bow are made of 100% polyester single-face satin 7/8" ribbon, and are 3" wide. Perfect for gift bags, favor bags and gift packaging! Our mini satin gift bows come with twist ties and are available in many popular colors. Plastic-coated wire twist ties make these bows quick & easy to use!